Congratulations to Jane Asher (Matric 1947) who was recently awarded a British Empire Medal (BEM) for her contribution to swimming. Jane Asher has been involved in club swimming for decades, and at 87 years old continues to compete for Wimbledon’s Kings Cormorants Swimming Club. 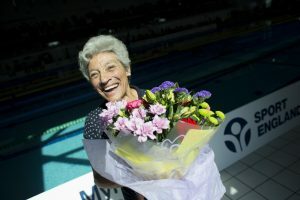 It was this longevity in the sport, as well as her years of inspiring others in teaching that saw her awarded a BEM (British Empire Medal) last week.She couldn’t believe it when she was told the good news. “My voluntary work started a long time ago and I got to know an enormous number of people over the years,” she said. “We started a masters club because there weren’t many about.